When we say we’ve thought of absolutely everything when designing and crafting our market-leading PVCu Sliding Sash Windows we really mean it, as you’ll observe each time you admire or operate them. You won’t find a better or more reliable example anywhere else. They maintain the elegant proportions of traditional sash windows whilst incorporating the very best in modern-day technology to deliver the low maintenance, high security and thermal properties of PVCu without the problems often associated with timber sash windows. 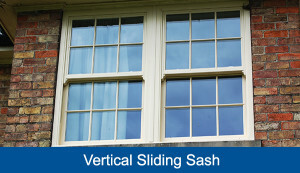 The sliding sash window operates like a traditional box sash window with both the top and bottom sashes slide up and down as standard. Spiral balances counteract the weight of the sash for smooth and effortless operation. They also come with a tilt facility that enables easy cleaning or extra ventilation at the push of a button.